Leaving at about 0700, sure enough there was a steady climb out of Santa Marta, being only 2k down the road energy was in good supply. It was great to be reveling in the simpleness of my mode of transport again. 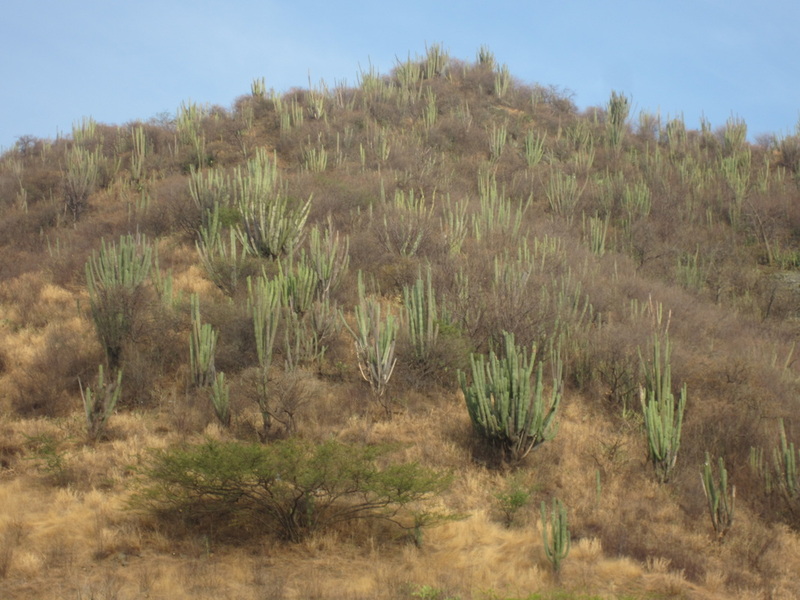 Three quarters of the way up another cyclist joined me, a local out for a ride, he spoke english and we had a good chat about Colombia, he worked for a coal company and had been to Australia, he took me down the the beach road at the foot of the hill out of Santa Marta,. The town with high rise buildings was much more touristic than SM. He pointed out his apartment overlooking the ocean, very nice. He was a great guy and good company. 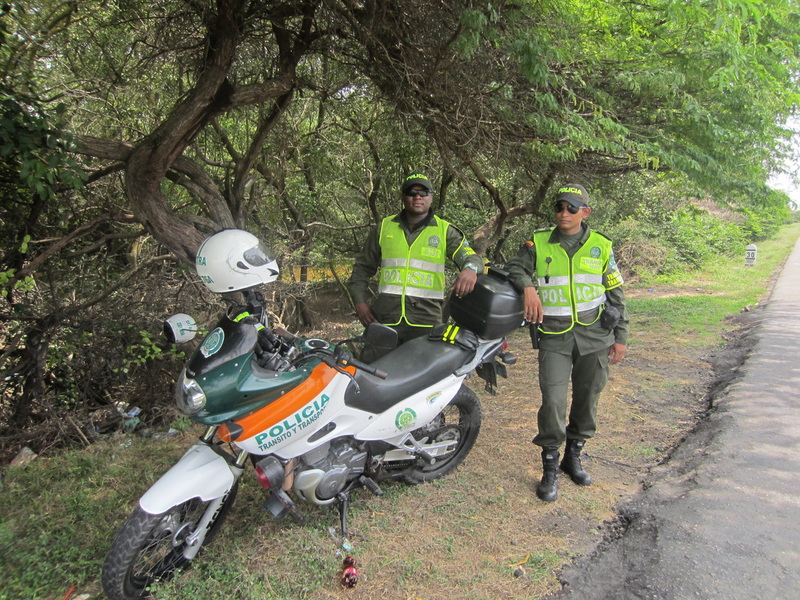 Colombia and many of its people have embraced cycling, many cyclists were seen on the road. Bogota and Medellin have great inner city bike tracks and many in the surrounds. Another person also told me its a great place to get spare parts. I had bandaged my knee, what you don't see doesn’t hurt you. Another cyclist joined me, we rode for about 10k, he too was enjoyable company. 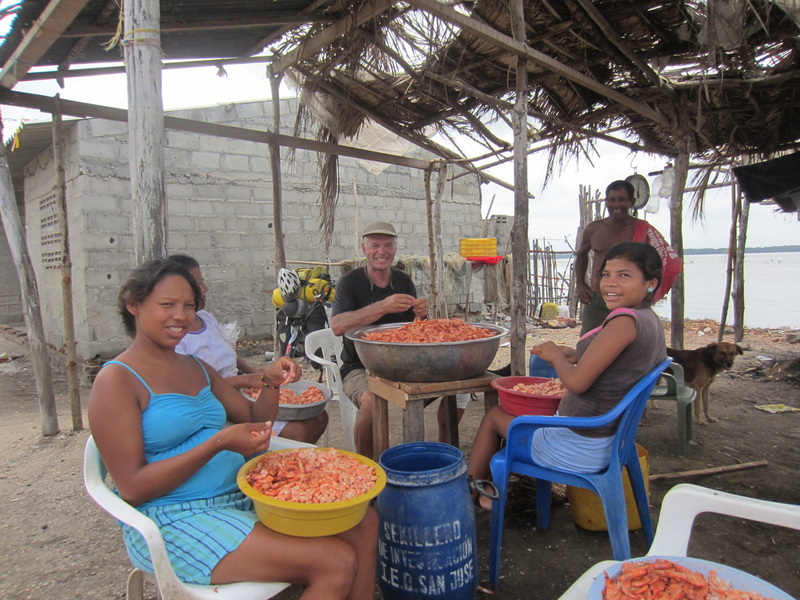 Arriving in Cienaga, there were prawn and fish stalls on the side of the rode for a few kilometers. Stopping to buy prawns they only had peeled specimens, without trying them, their age was unknown. Wanting prawns in their shells, asking around directions to a fishing village were found. A divine feed of as many prawns as required was consumed in the company of a family on the waters edge. They had this huge sow in amazingly good nick, 2yrs old and pretty much eats prawn shells all day. The girls were watching me peel prawns it didn’t take them long to work out I’d peeled a prawn or two. The woman and girls were peeling kilos of fresh prawns, they were great and showed me how to peel a prawn in 2 moves, myself taking 3. With a little practise this method would be best suited to a communal prawn eatathon, it was a quick method to say the least. They were very hospitable and friendly people and had me in their basic home to clean my hands. Blue swimmers were also caught infront of their house. Having a few drinks at a service station a few k on, but not topping up with water, it was not realized that there was no other tiendas between Puebloviejo and Barranquilla. The road is raised and runs for some 40k through mangroves and tidal flats. Mid way through in the heat of the day my water was almost finished. Checking my map it was confirmed, there were no settlements across this stretch. Some 10 k in things were getting a bit desperate, heat, concern about water, my fitness levels and dehydration added to this desparation. Thinking about using the water filter, it was evident all the water about was salt water or at best brackish, plus access to this water was through scrub and mud in most places. What was required was someone roadside, stopped. 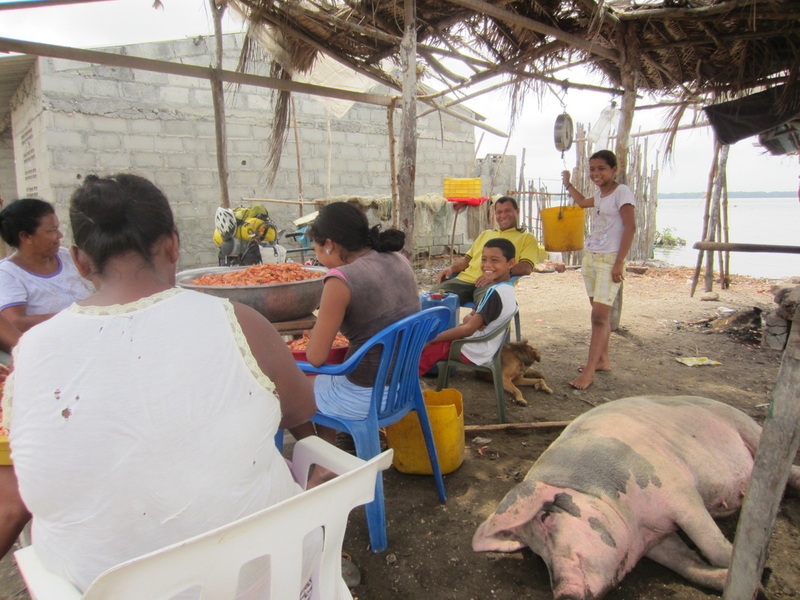 It was now 1200 and very hot with the trades coming off the Caribbean to my right, they offered some reprieve. Up ahead a bus was spotted pulled over, it was an ancient affair obviously with mechanical problems, Explaining water was needed the owner gave me half a small bottle. Literally dying of thirst must be such a psychological nightmare in the initial stages, especially when you first know you are in trouble. Water never tasted so good. It was just a taste however. He said, ask the policia up the road, two guys on a bike were sheltering under a tree in the shade. Pulling in, my predicament was explained. They were here observing traffic, great spot for it. They too had none. Though in their case, on their 650 trail bike it was never far away. Leaning the bike against a tree. We chatted, water in the scrub behind us was also found to be salty. Anyway we were getting to know each other and having a few laughs. Charlie showed me over all the gear on his belt, a camera, 9mm pistol and 3x15 round mags and hand cuffs, at one stage handcuffing me to the bike. We easily imagined two of them on the bike with myself running behind cuffed on as they headed off to the local lockup. It was a funny moment. We talked about all sorts of stuff for over an hour, it was a welcome break. Fluid was still needed. Anyway I said I will keep moving, Charlie said hang on. He headed out onto the road and selected a passing bus and directed them to pull over. He knew something not known to me, most buses carry drinks to sell to passengers of which 2 bottles of coke and some other malt brew were bought, they only had sodas. Charlie and Jason were two young guys,who had been in the policia for about 5 or 6 years. They were both a pleasure to have spent time with. Their help was so appreciative. My inquisitiveness as to our surroundings with my interest in Colombia and our conversation in Spanish, me all the while doing my best to understand, built a friendship in a short time. Thanking them from the bottom of my heart we bade farewell after a couple of photos. Some half hour down the road they cruised by waving and turned around up ahead, they had come to see if all was well. Its times like these that make cycle touring on the open road so special. More water was bought off people swimming on a wind swept shore, icey cold, it was most definitely the milk of the mother. 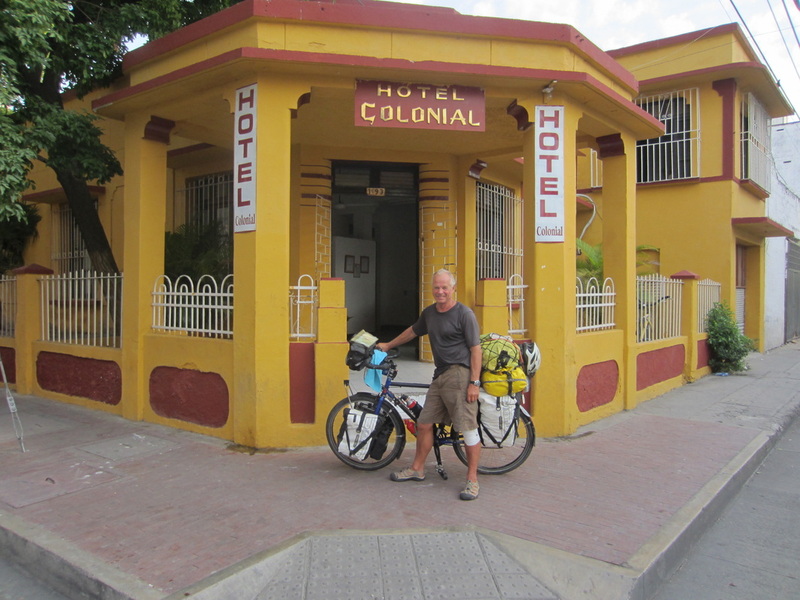 Arriving in Barranquilla at 1530 a hotel had to be found. Jason and Charlie had told me this was a commercial town. A working town so to speak. Never a truer word had been spoken. Traffic was chaotic,trucks, horses, motos, taxis, no lanes and pedestrians in the mix, asking for accommodation, every hotel was on the first floor with shops beneath, totally unpractical for me. Having been down this road, I kept riding and asking. Not long before dark, back tracking on instructions, a large hotel for truck drivers was found, it to was an upstairs affair. A heap of drivers were at the front door, good buggers, their first question was how much did the bike weigh, truck drivers and hauled weight are synonymous. The girl at the desk told me they did have ground floor units out the back. Great, it was nearly dark. At $10/night all was good. Totally trashed, would best describe my condition, though it was a great feeling, too hungry to shower, the bike was unpacked and put in the room, it just fitted, a meal was had, brakes adjusted, a shower taken, the days events partly documented. The bandage off my knee revealed major swelling, weird, no pain though. The place had no internet facilities. The drivers all over the place did all their communicating on cell phones. In bed at 2000, nothing was remembered from that point on. Vegetation at the foot of the climb out of town, many cyclists were training on this hill, me just hoping to get to the top was ample. What a seafood diet can do for a 2 year old pig. 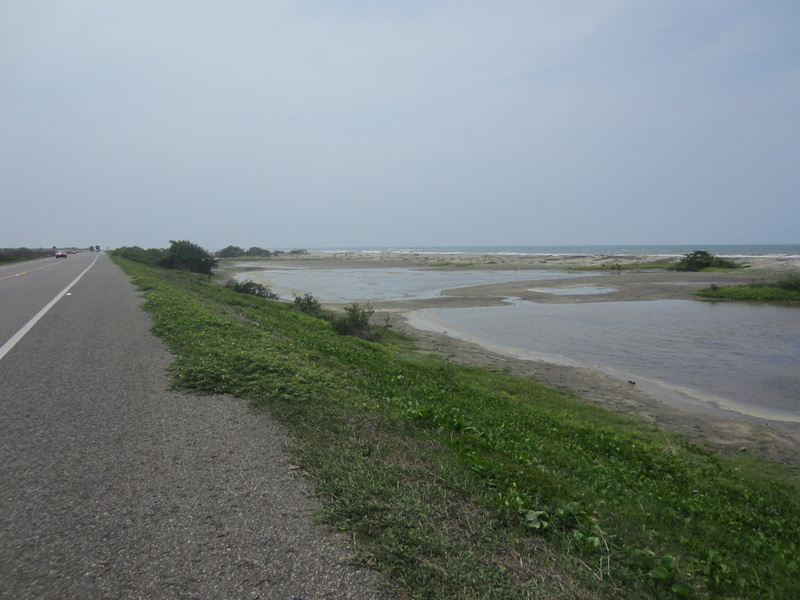 typical terrain for 40 k east of Barranquilla, Carribean in distance, water water everywhere and not a drop to drink. Prawns aplenty, such enjoyable company. 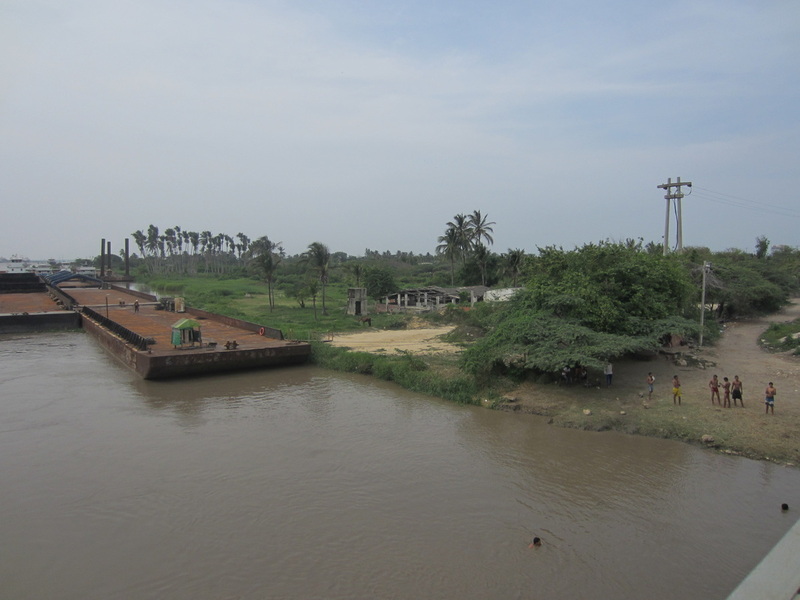 Rio Magdalena, a huge river easy capable of transporting huge trees to the ocean.